pojemność: e 17ml/0,57 fl. oz. | e 15ml/0,51 fl. oz. | e 5ml/0,17 fl. oz. Give your hair vitality and strength ! 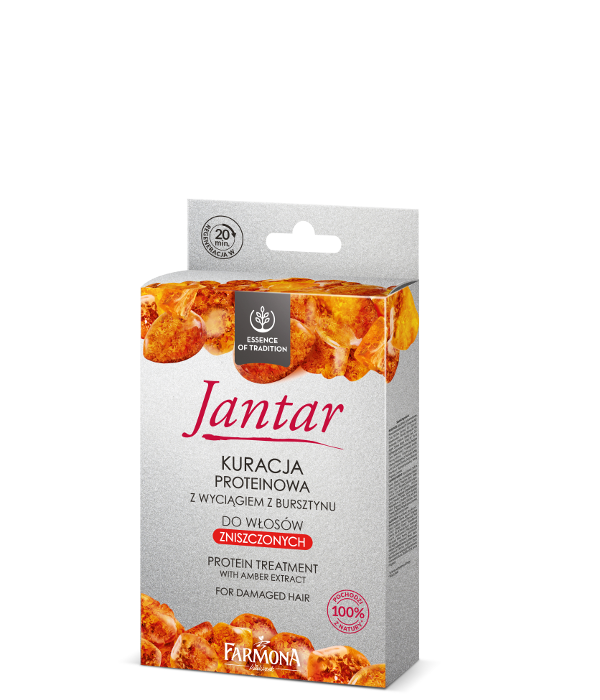 Jantar protein treatment is based on a unique and effective formula. It is a result of a long- term tradition of using the extreme properties of amber. Proteins are an indispensable ingredient of hair care treatments which strengthen and repair your hair. Applying emollients after them helps to smooth the scales of the hair and close the beneficial ingredients in it for longer. During particular stages of the treatment your hair absorbs the most valuable ingredients from each of them. leave for 20 minutes and then rinse. pour the shampoo out of the sachet onto your wet hair, massage until it foams and rinse. dry your hair with a towel, rub the serum from the sachet into it, and then comb it. Leave without rinsing. Aqua (Water), Glycerin*, Cetearyl Alcohol*, Oryza Sativa (Rice) Bran Oil*, Cocos Nucifera (Coconut) Oil*, Behentrimonium Chloride, Dimethicone, Cyclopentasiloxane, Dimethiconol, Laurdimonium Hydroxypropyl Hydrolyzed Wheat Protein, Laurdimonium Hydroxypropyl Hydrolyzed Wheat Starch, Hydrolyzed Keratin, Hydrolyzed Silk, Propylene Glycol, Amber Extract*, Soluble Collagen, Hydroxypropyl Guar Hydroxypropyltrimonium Chloride, Tocopheryl Acetate, Hydroxyethylcellulose, Phenoxyethanol, Ethylhexylglycerin, 2-Bromo-2-Nitropropane-1,3-Diol, Lactic Acid, Citric Acid, Parfum (Fragrance), Limonene.